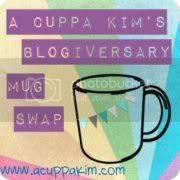 Life at Pemberley: Happy Blogiversary, Kim! wooo. thanks susan! thanks for jumping on the mug-swap train!!! :) i'm glad you are IN. and you totally must steal it ;) i think its a really FUN idea after all!! !